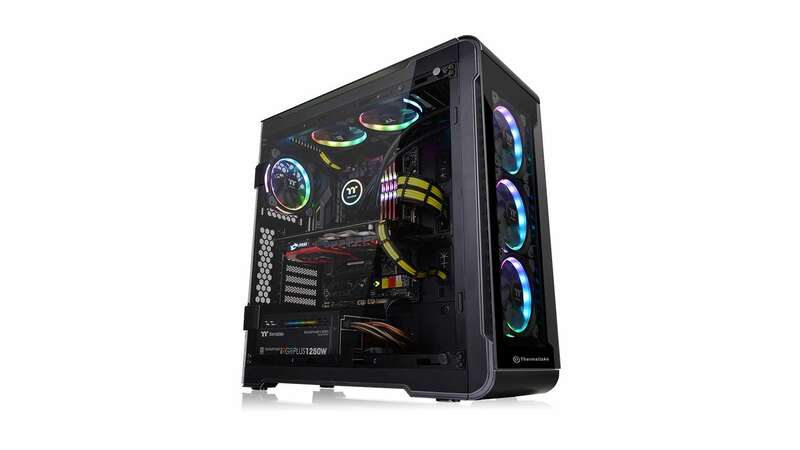 Thermaltake has been working hard over the last year or so to get away from the old school gamer aesthetic of overly aggressive, ultra-angular chassis and move towards a more sophisticated design. It matches the current mood in gaming; we’re not all children, or barely evolved males stuck in some weird twilight adolescence, and we increasingly want our PCs to reflect that. And to have RGB LEDs. They’ve got to have lots of coloured lighting because, as much as I am an evolved human being, I still want everything I own to be as shiny and covered in pretty lighting as I can possibly manage. The Thermaltake View 32 TG RGB Edition then is almost the perfect PC case under those demands. The surround-vision tempered glass panelling covers both sides of the case, as well as the top and front, giving you unfettered visibility to the myriad lighting choices you might have lurking inside your PC. And while it does come with a host of RGB fans, it still manages to maintain a style more subtle than you might otherwise expect. 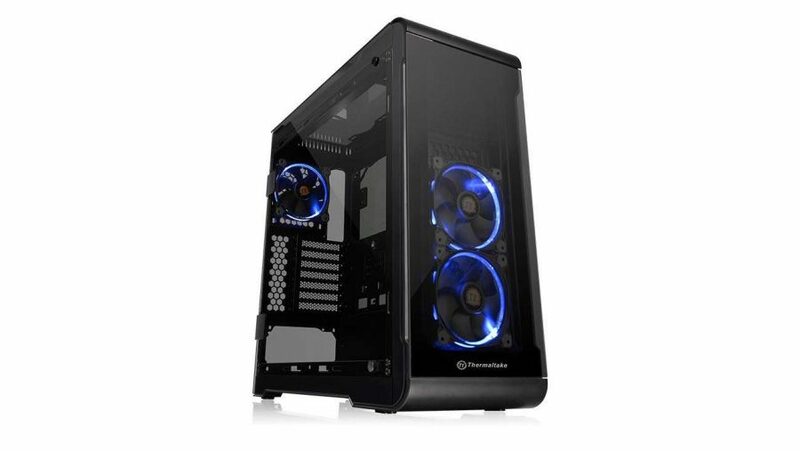 This Thermaltake mid-tower case will house either ATX, micro ATX, or mini ITX motherboards, so it’s pretty well-specced out for most configurations out there. The less-common extended ATX, or E-ATX, boards might be a little too expansive for this chassis – some of the rubber-protected cable cutouts will get covered by the wider motherboard standard. But other than that it’s impressively laid out for most gaming PC needs. The toolless mounts allow you to seat up to three SSDs, and a pair of hidden HDDs, inside the case with rubber dampeners to avoid any potential storage death rattles. Well, they’re not quite toolless, you do need a screwdriver to get the mounts off the chassis itself. 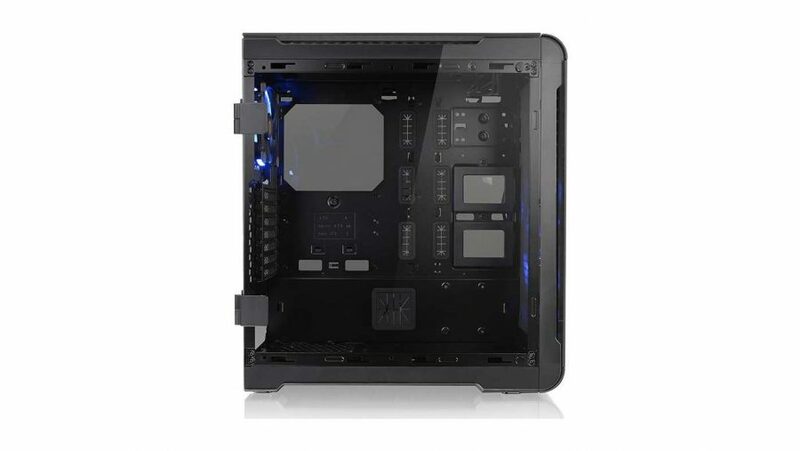 This tempered glass edition has complete, top-to-bottom side panels, with hinges so they can swing open to give you easy access to the internals. They can easily be lifted off too, so you don’t have to manhandle the chassis with a heavy flapping panel of 4mm thick glass to contend with. You will need to keep the supplied microfibre cloth to hand though as the View 32 is inevitably a real fingerprint magnet. And the panels aren’t without other issues, either. I’m not really sold on swinging chassis doors, but then I don’t usually operate on my machine in a space where there is space to swing a bat, let alone a slab of tempered glass. I also had to use a little force to encourage the hinged mounts to settle the panels correctly so they lined up with the holes you need to thumbscrew them into place. And on a $140 (£140) case that’s not something I really enjoy doing. The top and front panels do lift off easily so you can get your cooling on. 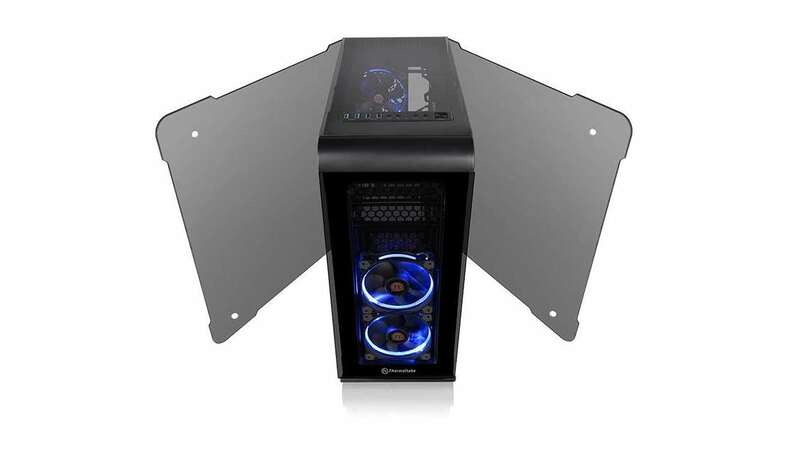 As standard it comes with three 120mm Riing LED fans (that’s not a typo, it’s a brand name), two in the front and another exhausting out the rear. There is an RGB controller inside the case too, allowing you to add another five RGB Riings to the system. You can control them via a single button on the top panel if you don’t want to use the Thermaltake software. The front panel can house up to three of the Riing fans, or a beefy 360mm radiator for your water cooling instead. In the top panel is space enough for a 240mm radiator, so you can take your pick where you mount your chip chiller’s liquid cooling. The main panel has a slightly lighter tint to it than the rest, making it easier to see all your high-end components in all their RGB’d glory, while the other three panels are dark enough so that the Riing fans aren’t too in your face and the cluttered mess of cabling you’ve failed to tidy up properly doesn’t stand out too obviously on the rear side. While there’s really nothing that special which really stands out about Thermaltake’s View 32 TG RGB Edition, it does what it does incredibly well. It’s a simple, elegant chassis, and one that will highlight your components and your build without detracting from them itself. And it will also provide them a good home, and you an uncluttered space to build into or upgrade your gaming rig further on down the line. A sturdy, sophisticated gaming chassis that nevertheless has its fair share of classic RGB illumination.